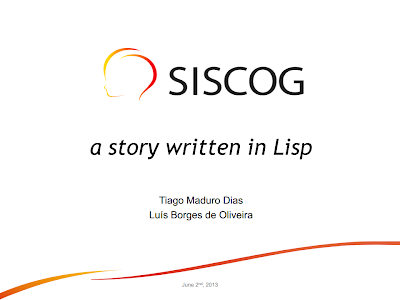 It took a while, but our ECLM 2013 slides “SISCOG: a story written in Lisp” have been published. Incidentally, they are also featured in Franz's ACL Success Stories, yay. On a related note, Vsevolod Dyomkin published his video recordings of the meeting. Sadly, we didn't get permission to publish our video.